Once there was a little boy who had never seen snow. Sure, he had read about it in books and watched it on TV. 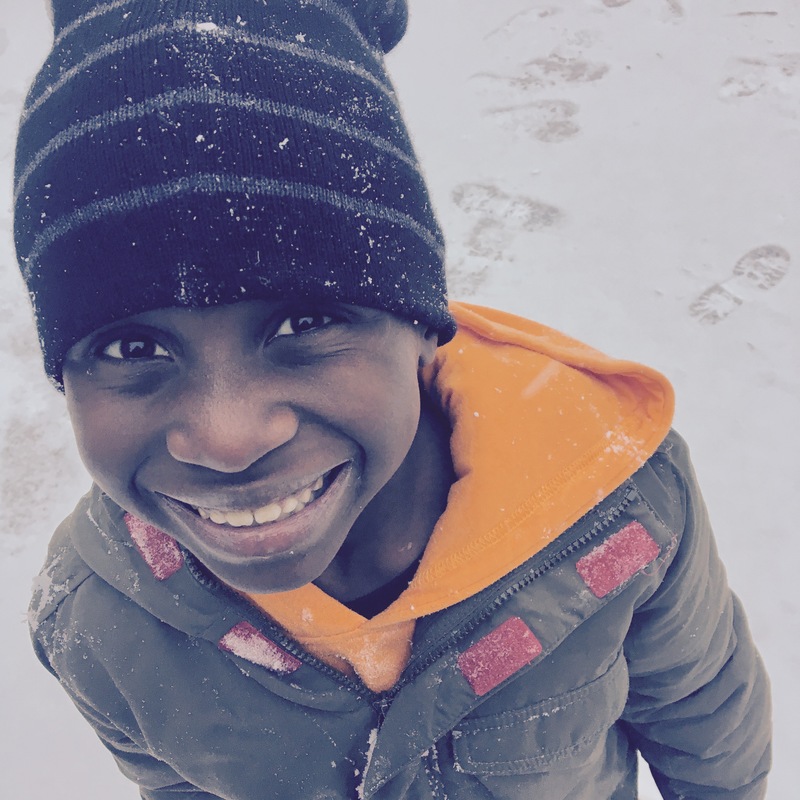 He had even seen home movies of his new brother and sisters—his ya-yas—throwing snowballs and making snow angels and sledding down hills, but his very own deep, deep brown eyes had never looked straight on those graceful, white flakes. And those graceful, white flakes had never lit on his eyelashes or shoulders or nose or outstretched mitten. On the hottest days before he left Kinshasa, his foster mama would cover his neck, back, and arms with talcum powder to soothe his skin. There, he napped every day, especially when the sun high up in the sky made him feel so sticky and sweaty and drowsy that he couldn’t imagine doing anything else. When it was springtime, the little boy left Kinshasa and flew across the world to his new home. He was excited to see new things, places, and people. He was excited to see snow. “Snow? For my birthday?” the little boy asked, hoping and wishing and praying. August brought muggy heat and he watched his ya-yas go back to school, but no snowflakes fell. In September and October, the little boy was delighted when the leaves on the trees magically turned gold and red. Then the leaves fell and by November, the air began to cool. “For my birthday?” he would ask again and again. “Maybe,” his mama would say, hoping and wishing and praying, too. After Christmas the little boy wanted to know if it was time for his birthday, so he asked his family. “No. Not for five days,” Ella said as she helped take ornaments off the Christmas tree. “Four more days,” Mama said as she made a yummy soup for their supper. “Three more days,” Lucy said as she packed her lunch for school. “Two more days,” Knox said as he sharpened his pencil to do his homework. The little boy followed his daddy to the window and looked outside. There was snow! Snow on the grass and snow on the roofs. The wind was blowing the snow in swirls. It flew in the air and landed in ocean waves. It was beautiful. The little boy dressed as quickly as he could, pulling up his ya-ya Knox’s borrowed long soccer socks and slipping on his ya-ya Lucy’s old pink gloves and letting his ya-ya Ella tie his warm hiking boots. He spent most of the morning exploring the backyard—jumping on the snow-covered trampoline and breaking the icicles that hung from the fence. When he was finally so cold that he couldn’t feel his toes or his nose, the little boy walked up the driveway to the back door. Before he went in the door and kicked off his boots, he looked behind him at his footprints in the snow. He saw the path where he had walked—all the places he had been—and he was happy. That would be a great kids book! Not stick figures, we would need to see those big brown eyes! Love, love, and love some more! Beautiful… our God sends such sweet, sweet gifts! !